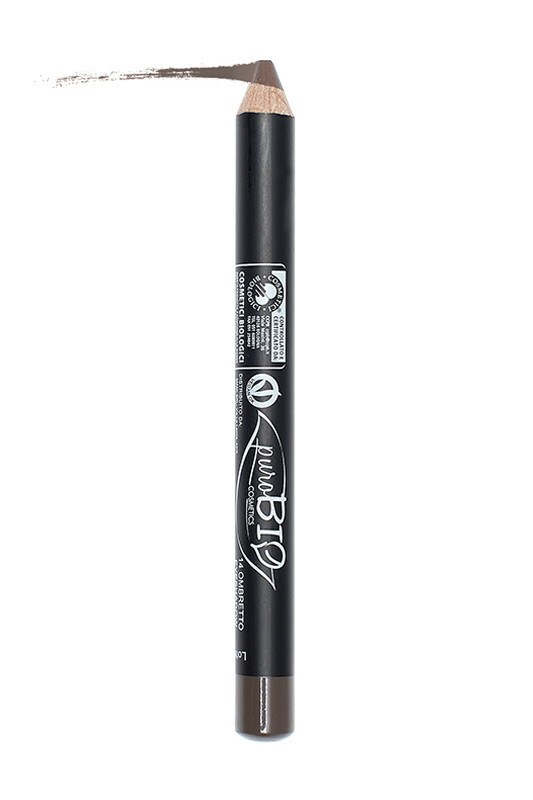 Purobio Organic Eye Pencils make up your eyes for a very luminous look. The cream texture is very easy to apply for a precise result. You will love the 5 pigment-coloured shades into a pencil! Formula enriched with organic natural oils of soya and apricot, it nourishes and moisturizes your eyes. Very soft to touch with a real comfort. 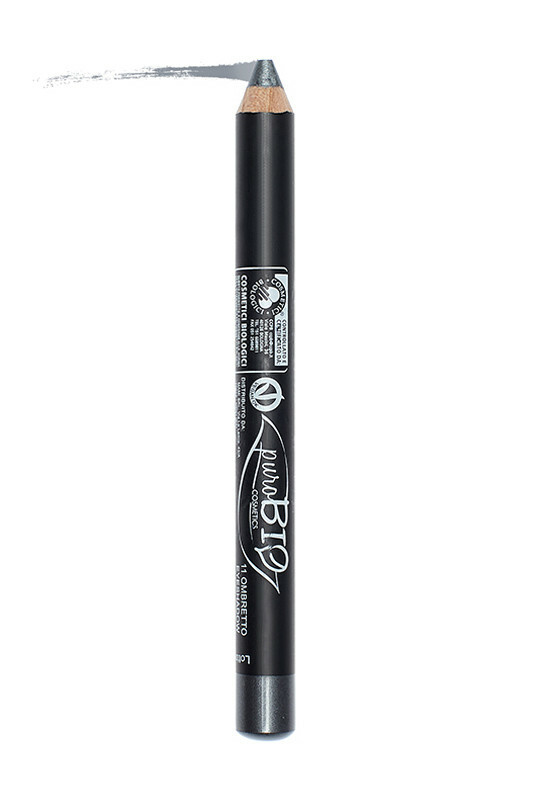 The Purobio Organic Eyeshadow Pencil is perfect to make up your eyes! Très bon crayon jumbo ! J'ai la teinte 11 Gris Sombre qui est vraiment très belle et se fond bien avec un fard noir. Le seul petit bémol, c'est qu'il file vite dans les plis car il n'est pas waterproof et j'ai la peau très grasse. PUROBIO Eyeshadows Pencils are easy to apply for a professional result! The eye shadow pencil can be used alone or as a base for powdered eyeshadow for intense results! Start by applying the eyeshadow pencil on the entire eyelid. Iron on top according to your desires for a better pigmentation. For a natural result, soften the edges to blend the colour to the skin by using your finger or n°4 brush or n°8 brush. For long-lasting hold, apply over eye shadow or Purobio loose powder. 11 Dark Grey Eyeshadow Pencil: Metallic finish, perfect for a smokey eyes look. 12 Blueberry colour Eyeshadow Pencil: light silvery highlights, ideal for a day or evening look. 14 Turtle-dove brown Eyeshadow Pencil: matt, ideal for creating contours. 22 Lilac Eyeshadow Pencil: cold and luminous, suitable for a fresh look. 23 Aquamarine Eyeshadow Pencil: silver highlights, ideal for a day or evening look. A natural composition without nickels in PUROBIO Organic Eyeshadow Pencils! INCI 11 Dark grey: OCTYLDODODECYL STEAROYL STEAROYL STEARATE, OLUS OIL (VEGETABLE OIL), MICA, C10-18 TRIGLYCERIDES, GLYCINE SOYBEAN OIL*, PRUNUS ARMENIACA (APRICOT) KERNEL OIL*, COPERNICIA CERIFERA (CARNAUBA) WAX*, HYDROGENATED VEGETABLE OIL, EUPHORBIA CERIFERA (CANDELILLA) WAX, POLYGLYCERYL-3 DIISOSTEARATE, GLYCERYL CAPRYLATE, TOCOPHERYL ACETATE, SORBIC ACID, CI 77499 (IRON OXIDES), CI 77891 (TITANIUM DIOXIDE). INCI 12 Blueberry color: OCTYLDODODECYL STEAROYL STEAROYL STEARATE, OLUS OIL (VEGETABLE OIL), C10-18 TRIGLYCERIDES, MICA, GLYCINE SOYBEAN OIL*, PRUNUS ARMENIACA (APRICOT) KERNEL OIL*, COPERNICIA CERIFERA (CARNAUBA) WAX*, HYDROGENATED VEGETABLE OIL, EUPHORBIA CERIFERA (CANDELILLA) WAX, POLYGLYCERYL-3 DIISOSTEARATE, GLYCERYL CAPRYLATE, TOCOPHERYL ACETATE, SORBIC ACID, CI 77007 (ULTRAMARINES), CI 77891 (TITANIUM DIOXIDE). INCI 14 Turtle Dove Brown: OLUS OIL (VEGETABLE OIL), OCTYLDODODECYL STEAROYL STEARATE, C10-18 TRIGLYCERIDES, COPERNICIA CERIFERA (CARNAUBA) WAX*, GLYCINE SOYBEAN OIL*, PRUNUS ARMENIACA (APRICOT) KERNEL OIL*, HYDROGENATED VEGETABLE OIL, MICA, EUPHORBIA CERIFERA (CANDELILLA) WAX, POLYGLYCERYL-3 DIISOSTEARATE, GLYCERYL CAPRYLATE, TOCOPHERYL ACETATE, SORBIC ACID, CI 77891 (TITANIUM DIOXIDE), CI 77499 (IRON OXIDES), CI 77491 (IRON OXIDES), CI 77492 (IRON OXIDES). INCI 22 Lilacs: OCTYLDODODECYL STEAROYL STEAROYL STEARATE, OLUS OIL (VEGETABLE OIL), C10-18 TRIGLYCERIDES, GLYCINE SOYBEAN OIL*, PRUNUS ARMENIACA (APRICOT) KERNEL OIL*, COPERNICIA CERIFERA (CARNAUBA) WAX, MICA, HYDROGENATED VEGETABLE OIL, EUPHORBIA CERIFERA (CANDELILLA) WAX, POLYGLYCERYL-3 DIISOSTEARATE, GLYCERYL CAPRYLATE, TOCOPHERYL ACETATE, SORBIC ACID, CI 77891 (TITANIUM DIOXIDE), CI 77007 (ULTRAMARINES), CI 75470 (CARMINE). INCI 23 Aquamarine: OCTYLDODODECYL STEAROYL STEAROYL STEARATE, OLUS OIL (VEGETABLE OIL), C10-18 TRIGLYCERIDES, GLYCINE SOYBEAN OIL*, PRUNUS ARMENIACA (APRICOT) KERNEL OIL*, COPERNICIA CERIFERA (CARNAUBA) WAX, MICA, HYDROGENATED VEGETABLE OIL, EUPHORBIA CERIFERA (CANDELILLA) WAX, POLYGLYCERYL-3 DIISOSTEARATE, GLYCERYL CAPRYLATE, TOCOPHERYL ACETATE, SORBIC ACID, CI 77891 (TITANIUM DIOXIDE), CI 77007 (ULTRAMARINES), CI 75470 (CARMINE).